Shared joy is a double joy. 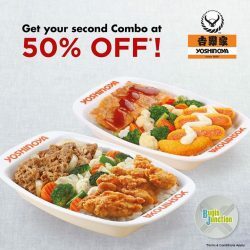 Grab your best pal and enjoy a second Combo at 50% off with purchase of one à la carte Combo at Yoshinoya Singapore! 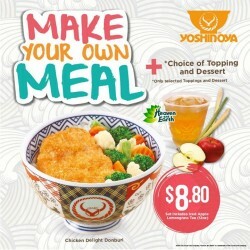 Visit Yoshinoya at Bugis Junction (#B1-10) today! Chase your Monday blues with their crispy Tori Karaage drizzled with Home-made Teriyaki Sauce. This set comes Premium Tori Yuba with spicy Tangerine sauce. Each crafted Tori Yuba filling combines quality Tori (Chicken) with the crunch of sweet shredded carrots. 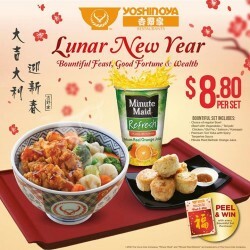 Prosper to the Lunar New Year with thier bountiful spread of delectable Don (Rice Bowls) to choose from in pairing with Yoshinoya Premium Tori Yuba with spicy Tangerine sauce. Each crafted Tori Yuba filling combines quality Tori (Chicken) with the crunch of sweet shredded carrots. This is, without doubt, a beautiful contrast that makes you crave for more. 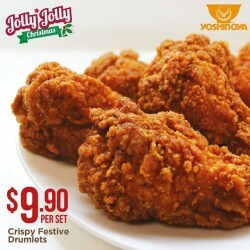 Enjoy your meal with this Crispy Festive Drumlets for $9.90 per set. Grab now and enjoy this affordable delicious meal! Create your own meal with delectable imported Japanese pearl rice Donburi featuring Chicken Delight with your choice of Topping (Suitokon, Chuka Wakame or Tamago) and Dessert (Nata Pudding, Pineapple Jelly or Mixed Fruits). Pair your meal with refreshing apple lemongrass tea (12oz) $8.80! Get an oozing cheese sauce on their crunchy Ebi Fry with delicious prawn on the bed of Premium Japanese Rice and colorful mix of vegetables! 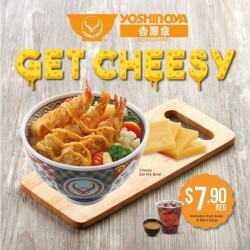 Only at $7.90 regular, includes Iced Soda and Miso Soup @ Yoshinoya. So, what are you waiting for? Hurry! 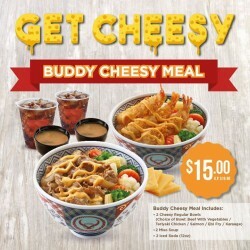 Got a friend that loves those delicious creamy cheese as much as you do.We got this specially prepared for you with extra value! Promotion is for limited time period only, so what are you waiting for grab yours today! Get your loyalty card and redeem these free goodies behind each stamp collected! Every $10 spent = 1 digital stamp. Terms and conditions apply. Hurry! 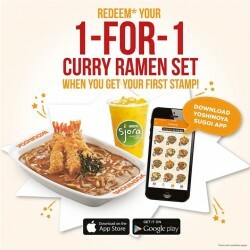 Enjoy today and Get your loyalty digital card when you download Yoshinoya Sugoi App! 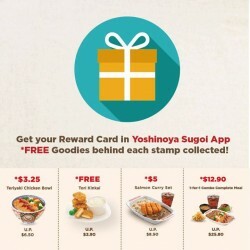 Rewards behind each stamps collected with each Value or Complete meal purchase!